I’m still tired. And, bemusingly, eating like I’ve not had a meal in days. I had a huge chunk of leftover shepherd’s pie for lunch, and a ginormous kebab + chips for dinner. I guess I shouldn’t be that surprised. After all, I’ve been ill enough the past week or so that I find myself shaking. That is definitely lessened by eating. Hopefully things will settle soon, ’cause I’m really bored of this being extra-ill crap. Still, I’ve managed to be productive today. I got a satisfactory measure of work done. I’ve had a bath. I’ve had good cuddles and play with the kidlets. I’ve done a little bit of knitting. 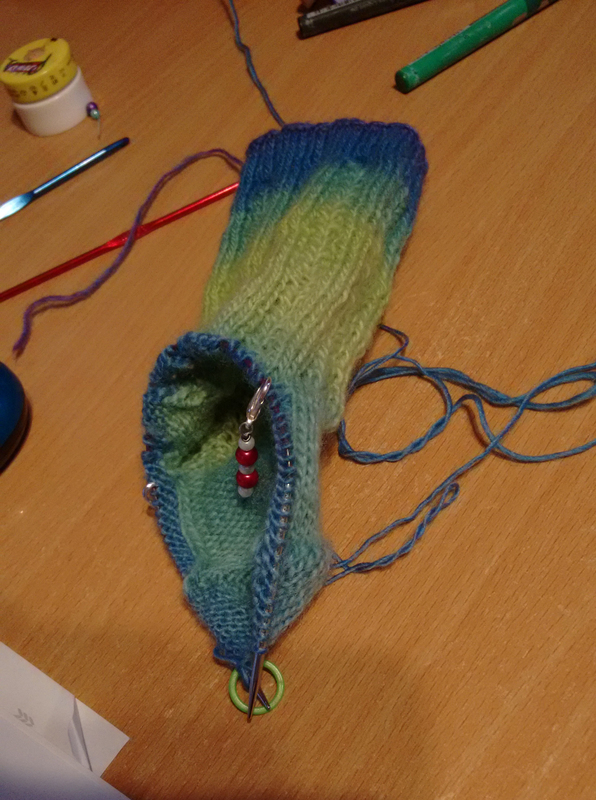 I turned the heel last night and am slowly getting my head into gear for the gusset-into-foot section. I’m loving how nice the colours look upon rejoining to the leg section. While it’s not the slow and gradual colour change, it still works as it dives into blue. It’s a nice thing to think about. Beyond all the fog and tired and trying to be positive… eh. Mom was cremated today. She’s back home now, tucked up into bed again, so bat says. Makes sense to me. I slept quite a few random moments today wishing that I could close my eyes and see pretty pictures like other people, to flesh out the conversations I was trying to have with her in memory, in the now. At least my dreams are vivid, so maybe she’ll visit me there. I can only hope.